Although a burn blister may result for several different causes such as fire, a chemical burn, or a sunburn, the best piece of advice that can be given is to leave it alone. That doesn't mean to ignore it, it needs to be treated as does the pain if is probably causing. Leaving it alone simply means not disturbing by attempting to remove the loose skin on top, or piercing it to release the accumulated fluid. Why Leave It Alone? - The dangers associated with breaking the surface of a burn blister are two-fold. First, the healing process on the skin may be disrupted and second, the blistered area become very susceptible to infection. If for whatever reason a need is seen to pop or remove the fluid from a blister it should be done by a licensed practitioner. Removing the top layer of skin from a blister is known in the medical community as deroofing. Removing the fluid by piercing the blister and drawing the fluid out is called aspirating. Studies have shown that a burn blister that is left intact has about a 10% chance of becoming infected, while around 3/4 of blisters that have either undergone aspiration or deroofing become infected. Deroofing a blister generally has no effect on the pain that is being felt in the area. 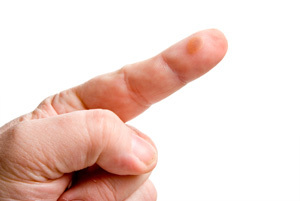 Aspirating a burn blister provides relief to about a third of burn victims. In summary, the best approach is - leave the blister alone. A Second Degree Burn - A burn blister is a second degree burn. When one is subjected to a first degree burn there will often be redness and pain, with perhaps swelling in some instances. Only the outer layer of skin has been affected by a first degree burn, so this is the least severe of the three categories of burns. A second degree burn, in which a burn blister or several will likely appear, affects the underlying layer of skin as well as the outer layer. While both layers have been damaged, they will heal, usually with the inner layer healing first. If one is unfortunate enough to suffer a third degree burn, the skin has been badly damaged, probably charred, and may not heal properly, leading to scarring and deformities. Third degree burns, especially if extensive, can lead to other complications and can in some cases prove fatal. This is seldom the case with second degree burns, although if a large area has been burned, immediate treatment should be sought. Cool The Blister - When a burn blister appears, immersing the area in cold water will usually relieve the pain and also, by drawing heat away from the area, allow the healing process to begin. When the blister is due to a sunburn, one recommendation is to apply ice water to the affected area. This is a somewhat controversial approach, and is not recommended, especially if the blistered area is large, as the victim could go into shock. Cold running water, a cool bath or shower is fine, but icy cold water should be avoided. Protect The Blister - A burn blister needs to be protected to avoid its being broken which can lead to infection. This is best accomplished by wrapping the area in sterile gauze, several layers if need be, but gently to avoid putting pressure on the burn blister, and protecting the area from hard contact. Before wrapping the area, a moisturizing lotion can be applied. Avoid butter, as that will hinder the healing process. Nothing should be applied to a more severe burn, such as a third degree burn however. Some say that any blister larger than a quarter should be brought to the attention of a physician or dermatologist. This depends somewhat on the location of the blister, as the issue here is potential scarring. Any burn blister larger than 3 inches in diameter should definitely be brought to the attention of a professional. Such a large area is an invitation to infection or other complications, and healing may be more complicated than is the case with a small blister. In summary, keep the blister cool, don't open it, and wrap it gently to protect it. See a doctor if it is large, or if a large area has been burned and there are many blisters. And certainly seek medical help if the pain is severe or if the victim appears in danger of going into shock.